This week we are talking snaps here at Uniquely Michelle! We have already talked about the two different types of snaps, metal snaps on Monday and plastic snaps on Tuesday. On Monday, I explained why I think SnapSource’s SnapSetter Tool is the best tool for installing metal snaps. I love SnapSource snaps too, they come in so many different colors and sizes. Today, I will show you how to use the SnapSetter to install SnapSource metal snaps. This tool along with these snaps changed me from a snap hater to a snap lover! Just a quick reminder, the products I recommend are based on my use and opinion of them, I have not been given anything from the companies that make my favorite products nor do they even know that I wrote this blog series. I am going to explain how to install a size 16 snap. 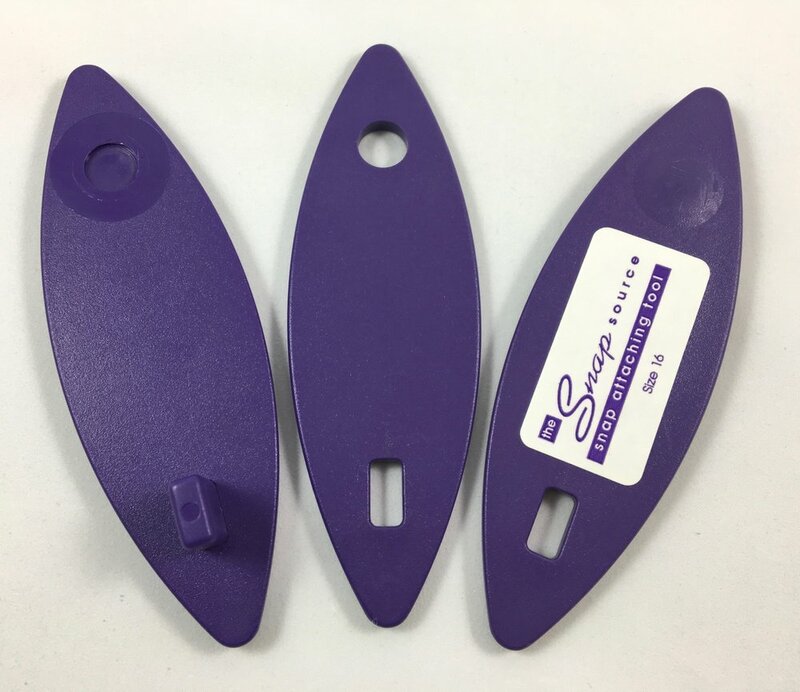 The process is the same when using other sizes of snaps, but you will need an adaptor base for the SnapSetter if you plan on installing size 20 or 24 snaps. You will need the size 16 SnapSetter Tool and size 16 snaps (size 18 snaps will work too), both available from SnapSource. You will also need a ruler, a marking pen or pencil and a hammer. Let’s quickly discuss the parts of a snap so that we are all on the same page. The picture on the left shows the side of each snap piece that you will see once it is installed (the right side). The picture on the right shows the side of each snap piece that is against the fabric once it is installed (the wrong side). The cap is the colorful part of the snap that is a solid circle with prongs on the back (upper left piece). The socket has a hole in the middle and no prongs (lower left piece). The prongs on the cap secure the socket in place on the item you are making. The socket is the part that snaps to the stud. The stud has the raised center area and no prongs (lower right piece). The back ring is a circle with prongs on the back of it (upper right piece). The prongs on the back ring secure the stud in place on the item you are making. The SnapSetter has three parts that stack together. There is the base with an indentation for the cap or bottom ring to sit. Next there is the middle part with a hole that aligns the socket or the stud perfectly. Finally the top part with a raised area that you will hit with your hammer. 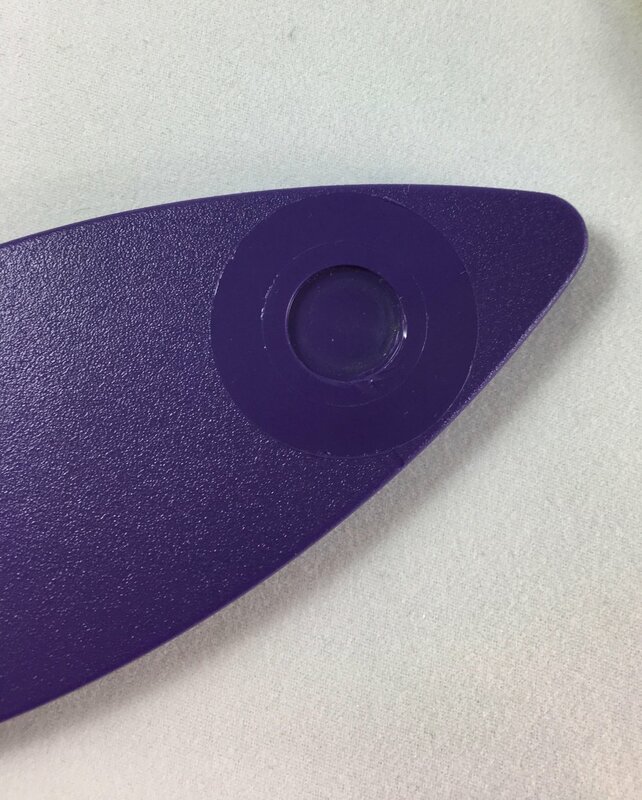 We are going to start by marking the placement of the cap part of your snap. Follow the instructions for the item you are making to measure the location for the cap and mark that spot using a marking pen or pencil. Make sure you are marking the part of the project and the side of that part where the cap will be placed. This is the most difficult part of installing these metal snaps and it isn't that difficult, it's just worth spending a couple extra minutes making sure you get it right. The reason it is a bit difficult is because the cap covers the mark, making it difficult to see where you are supposed to place the snap. So there is a lot of peeking under the cap while trying to get it centered on the mark. I usually eyeball it to begin with and then get out my ruler again to check if the center of the cap is where it is supposed to be on my project. Now push the prongs through all the layers of fabric and interfacing. I like to use a clean pencil eraser to help me with this. Place the base of your SnapSetter on a solid surface, place your creation cap side down and with the cap fitted in the indention of the SnapSetter base. Next, add the middle part of the SnapSetter, this will help align everything perfectly. Now place the socket in the hole of the middle part of the SnapSetter with the side that is more raised facing down toward the prongs. This is important so that the prongs can attach correctly. To check that you have placed your socket correctly, you should have the side that has a flower-shape look to it facing up. Place the top part of the SnapSetter over all of this and give it a few good hits with the hammer on the raised part of the SnapSetter Tool. I always think that I probably only need one good whack with the hammer, but usually give it three or four solid hits just to be sure. Now for the easy half of the snap. 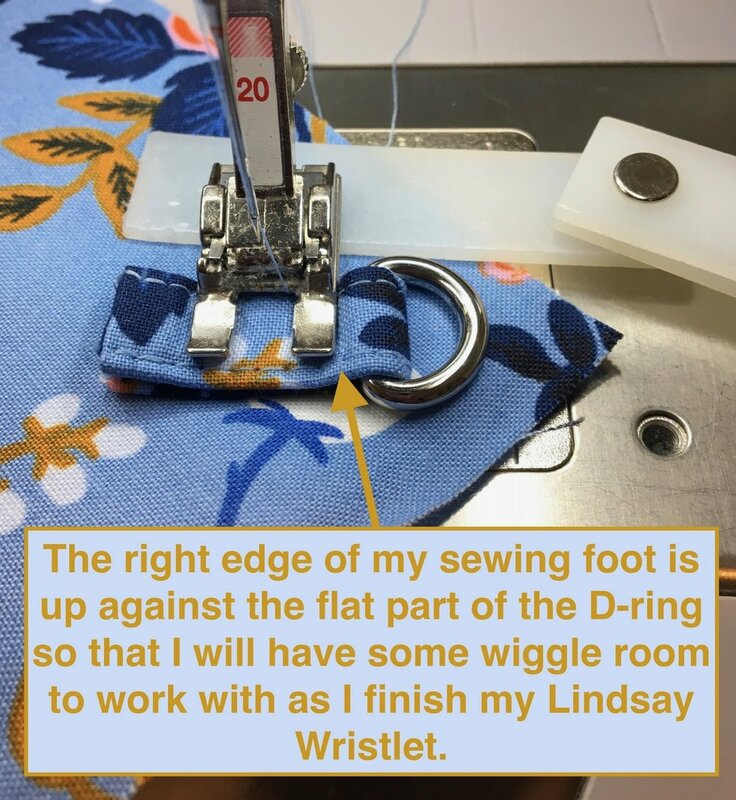 Follow the instructions for the item you are making to measure the location for other half of your snap and mark the spot where the back ring will be placed using a marking pen or pencil. I like to check the placement mark for the second part of my snap to make sure it will line up with the first part of the snap I just installed. Place the back ring centered, over the mark that is on the opposite side of the fabric from where the stud will be placed. Push the prongs through all layers of fabric and interfacing as you did with the prongs on the cap. Again, make sure the base of your SnapSetter is on a solid surface, place your creation back ring side down and with the back ring fitted in the indention of the SnapSetter base. Add the middle part of the SnapSetter. Now place the stud in the hole of the middle part of the SnapSetter with the raised side facing up toward you. Place the top part of the SnapSetter over all of this and give it a few good whacks with the hammer on the raised part of the SnapSetter Tool. This Just The Ticket Luggage Tag has its snap installed and is ready to be finished up! I always do a quick test of the snap once it is completely installed by snapping and unsnapping it a few times. I have never had a SnapSource snap that I have installed with a SnapSource SnapSetter not turn out well. The only caution I would give you is that if your fabric and interfacing are so thick that the prongs will not go through all the layers, you will not be able to install the snap securely. I have cut out some of the interfacing before in the place where the snap will be installed to reduce the layers so that the snap will install securely. If you do have a problem with the prongs not lining up well, you can carefully use a small flathead screwdriver to pry the snap parts apart. Then you can reinstall that half of the snap. As with most things like this, it is a good idea to practice installing a few snaps on a scrap piece. I would recommend using a couple pieces of fabric with some interfacing between them. With the SnapSetter and snaps from SnapSource, it really is easy to install pretty, metal snaps! I love the professional look that adding a metal snap gives to a bag or other creation. And with so many color options, it is easy to find a color that will match your project beautifully. I hope your excitement is building as you now know how easy it can be to install metal snaps! Tomorrow we will talk about how to install plastic KAM snaps! Once you know how easy it is to install both SnapSource metal snaps and plastic KAM snaps, you will just have to decide which one you will use on the free pattern that I will be sharing with you on Friday! Make sure you don’t miss out on what is happening at Uniquely Michelle and sign up for the Uniquely Michelle newsletter below! Welcome to the second day of the snap blog series! Through this blog series, I am hoping to share my love of snaps with you. I haven't always loved snaps, but I have found that by using the good quality snaps along with the tools designed to install them, snaps can be fun to use! If you missed it, yesterday’s blog post was about metal snaps - which metal snaps work best and where to buy them. In today’s blog post I am going to talk to you about the other type of snap, plastic snaps. Once again, I want you to know that the products I recommend are based on my use and opinion of them, I have not been given anything from the companies that make my favorite products nor do they even know that I wrote this blog series. KAM snaps! This is the limited edition Pantone multi-color pack. Photo from the KAMsnaps website. I was first introduced to plastic snaps while making Days for Girls kits that require plastic, KAM snaps. At the time, all I used was SnapSource metal snaps and so I was unsure that plastic snaps would hold up well, and I was afraid they would break easily during installation. I was wrong! KAM snaps are very strong and are very easy to install. There is another brand (Babyville) and there are off-brands of plastic snaps too, but the reviews are not as good for those as they are for KAM snaps. I don’t feel comfortable recommending them since I have not used Babyville or the off-brands. If you have some experience with these other brands, let me know in the comments. Photo from the KAMsnaps website. KAM snaps come in a variety of colors and sizes, the most common size used in KAM snaps is size 20. Some colors of KAM snaps can be purchased in a matte finish instead of a shiny finish. KAM snaps offer some different shaped snaps and some snaps that are engraved as well. The KAM snap pliers (required for installing KAM snaps) can be bought in a kit that includes K2 pliers (basic pliers not the floral pliers), dies for installing snaps that are sizes 20, 22, 24 and for the heart, flower, butterfly and star shapes, 100 sets of size 20 snaps, an awl, and a screwdriver (used to change the dies) for $16.99. The only other tools that you need to install KAM snaps is a ruler and a marking pen or pencil. Now that I have shared my recommendations for both metal and plastic snaps, I will tell you that metal SnapSource snaps are my go-to favorite snaps. I like the professional look that metal snaps give to a project and I think they are more durable in the long run. That being said, I think KAM snaps are a very good option and can in some cases (items made for babies) can be a better option. I don't think you can go wrong with either SnapSource metal snaps or plastic KAMsnaps. I am excited for the next two posts in the snap series! The next two posts are all about what usually scares people away from using snaps, installation. Tomorrow, I will show you how easy it is to install colorful SnapSource metal snaps using the SnapSetter Tool. Then on Thursday I will walk through the installation process for KAM snaps. By Friday, I think you will be excited to install some snaps yourself, so I will share a quick and fun little FREE pattern for you that includes a snap! Make sure you don’t miss out on what is happening at Uniquely Michelle and sign up for the Uniquely Michelle newsletter below! Snaps . . . does the mention of the word make you cringe? Maybe you are like me and you love them! But I have not always loved snaps, for a long time I actually hated them. I hated having the cute baby outfit mostly finished only to fail about half the time I tried to get the snaps installed well. Then I was introduced to a new way to install snaps and that completely changed my mind about snaps – now I LOVE them! Before we go any further, I want you to know that the products I recommend are based on my use and opinion of them, I have not been given anything from the companies that make my favorite products nor do they even know that I wrote this blog series. A Just the Ticket Luggage Tag with a metal snap from SnapSource. This week, I am going to talk snaps – the different types available, where to buy them, and how to install them. Toward the end of the week, I will share a free pattern with you that has a snap, so you can try it out. I think once you know more about snaps, you will enjoy installing them as much as I do. A metal snap from SnapSource on a Kristine ID Wallet. Today, I am going to introduce metal snaps - where you can purchase these snaps and the tool you will need for installing them. There are two types of snaps available, metal and plastic. Both of these have their advantages and if you get the correct brands and tools, they are both easy to install correctly almost every single time. When I started using snaps, I bought them from JoAnns. They were just the regular metal, ring snaps that are best installed with a plier kit for installing snaps and grommets. Sounds easy enough, but this is the point where I learned to hate snaps. The pliers did not work as well as I had hoped. It was almost as easy to set a snap wrong as to set it correctly. Looking at the reviews for this product (Dritz Plier Kit for Installing Assorted Snaps) on JoAnns, you will see that I am not the only one who struggles getting the pliers to work well. I do not recommend this product. The best metal snaps and tool for installing them are from SnapSource. The SnapSetter Tool by SnapSource is what changed me into a lover of snaps. SnapSource also has a wonderful assortment of snaps available to choose from in a large variety of sizes and colors. I have used my SnapSetter Tool with SnapSource snaps for several years and it is still going strong. I have the size 16 SnapSetter tool. The size 16 SnapSetter Tool can be used for cap and pearl snaps that are sizes 16, 18, 20 and 24. You will need a SnapSetter Tool Adaptor Base for pearl snaps that are sizes 16 and 18 and cap snaps that are sizes 20 and 24. The SnapSetter Tool is $9.00 and the adaptor (if you decide to purchase it) is only $3.25. The snaps range in price depending on size and type (pearl snaps are more expensive), but you can get 10 sets of size 16 cap snaps (the most common size for metal snaps) for $3.75 or 50 sets for $10.30. The only other tools you need are a hammer, a ruler, and a marking pencil or pen. I am so excited about this week's blog posts about snaps. I hope you come to love snaps as much as I do by the end of this week! Tomorrow, I will discuss plastic snaps and let you know which ones I use and why. Installing metal and plastic snaps will be the topics of Wednesday and Thursday's blog posts. Then on Friday, I will be sharing a free pattern that uses a snap! Make sure to keep up with all the posts this week by signing up for the Uniquely Michelle newsletter below! 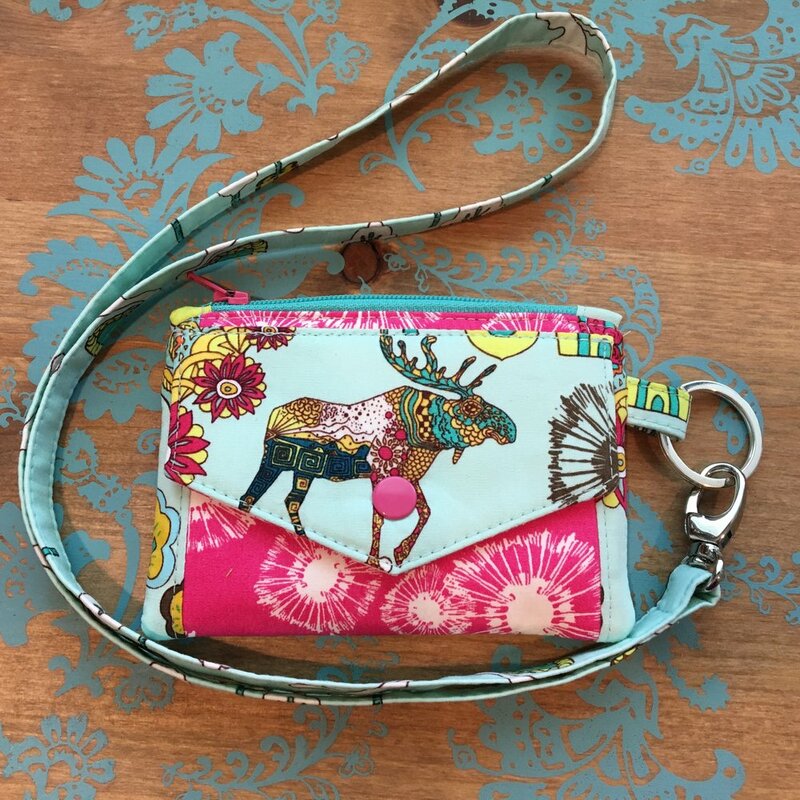 The Lindsay Wristlet is practical to use and fun to sew. I love taking my Lindsay Wristlet to the grocery store or sporting events and it is my go-to bag all summer long when I don't feel like having the extra bulk of a large bag. The only thing that I have sometimes wished for is to be able to carry a Lindsay Wristlet hands-free. A wristlet is somewhat hands-free, but it can get in the way when it is dangling from your wrist. During Lindsay Wristlet Week a couple of years ago, I wrote a blog post tutorial on adding a crossbody strap to the Lindsay Wristlet. It was a good option, but I wanted to be able to eliminate the strap connectors from the sides. I didn't like that they stuck out in an odd way when I was using my Lindsay Wristlet without the crossbody strap but instead with a wrist strap or as a wallet with no strap at all. I am happy to say that I came up with a solution! 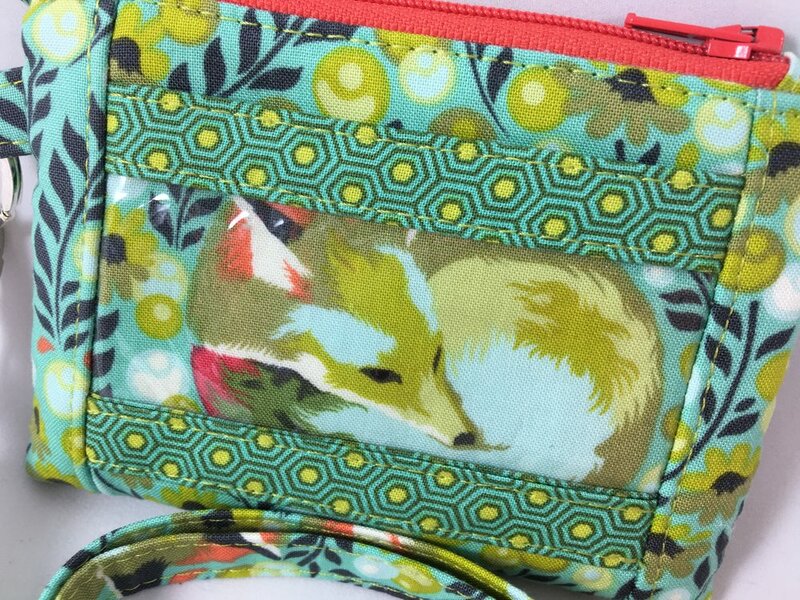 I just changed up the placement of the strap connectors, adding them to the back of the Lindsay Wristlet instead of to the side seams. 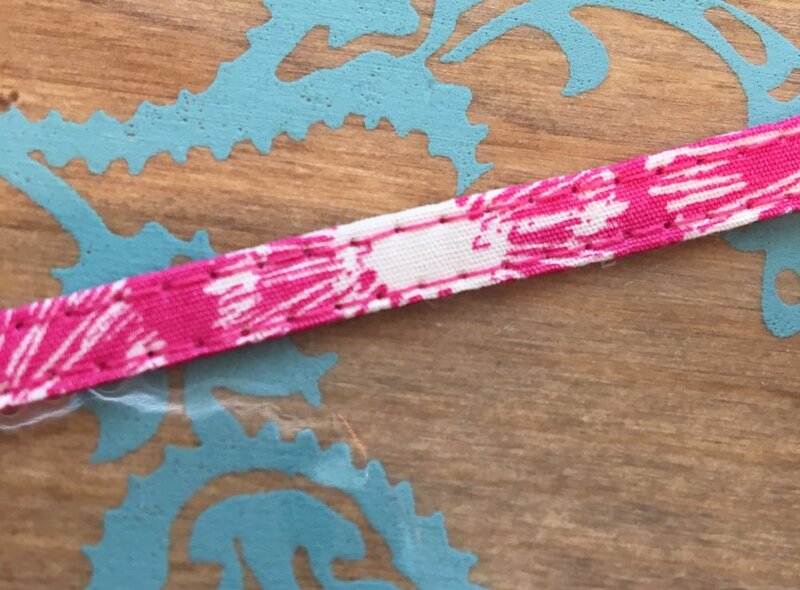 I tried this option out on the Lindsay Wristlet that I made myself for a trip that my husband and I took to Europe this spring. I wore my Lindsay Wristlet as a crossbody bag most of the time. Sometimes I had it on a lanyard when we were in the more sketchy parts of Rome where the pick-pocketers are an issue. I used it as a wristlet occasionally and I put it in my carry-on, in wallet form, without any straps when we flew or traveled by train. It was a perfect little travel companion that held my passport, credit cards, cash, phone, and lip gloss. So, would you like to wear the Lindsay Wristlet as a crossbody? Well then, I wrote this tutorial for you! This is an easy and quick supplement to the Lindsay Wristlet pattern! 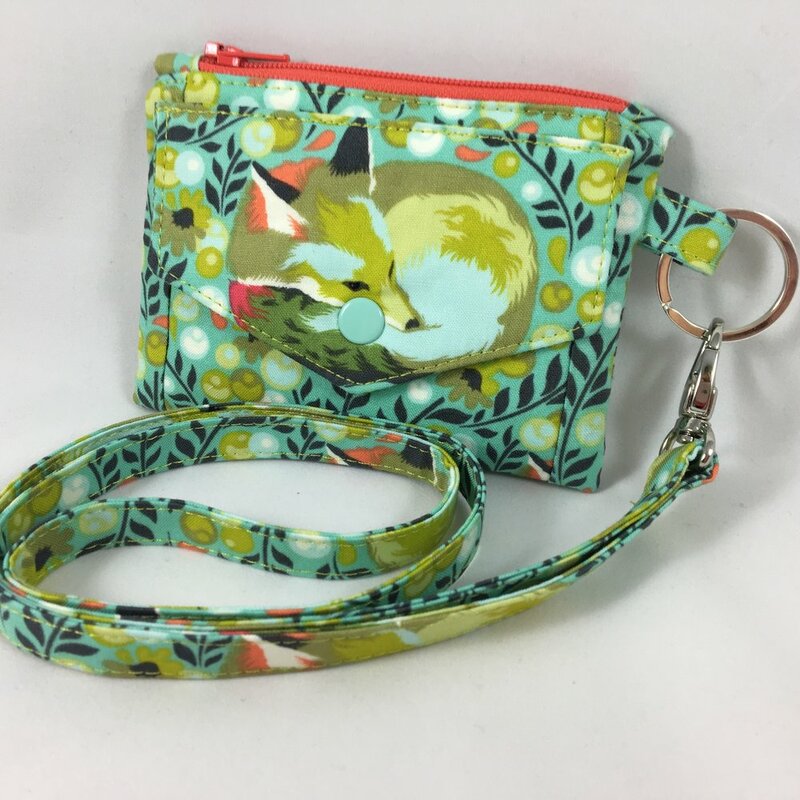 You will need to refer to the Lindsay Wristlet pattern for the fabric and interfacing cuts and instructions for making the majority of the wristlet. Let's get started! 3. Fold the Anchor Piece in half the long way, wrong sides together and press. Now, fold the two raw long edges into the center fold, wrong sides together and press. With all the folds in place, press the Anchor Piece well. (see photo below) Repeat this step for the second anchor piece. Hint: I use my Bernina Height Compensation Tool to keep my sewing foot level as I sew the Anchor Piece in place. This keeps my stitches nice and even. (see photo below) To read more about how the Bernina Height Compensation Tool works, check out this blog post: Sewing Has Its Ups and Downs. 8. One more thing is needed - the crossbody strap! To make the crossbody strap, refer to the blog post from Lindsay Wristlet Week, "Adding a Crossbody Strap to the Lindsay Wristlet - Part 2." The Lindsay Wristlet sewing pattern is available to purchase from the Uniquely Michelle Website Shop, the Uniquely Michelle Etsy Shop or the Uniquely Michelle Craftsy Pattern Shop. Make sure to keep in-the-know on all the latest happenings at Uniquely Michelle by signing up for the Uniquely Michelle newsletter below! 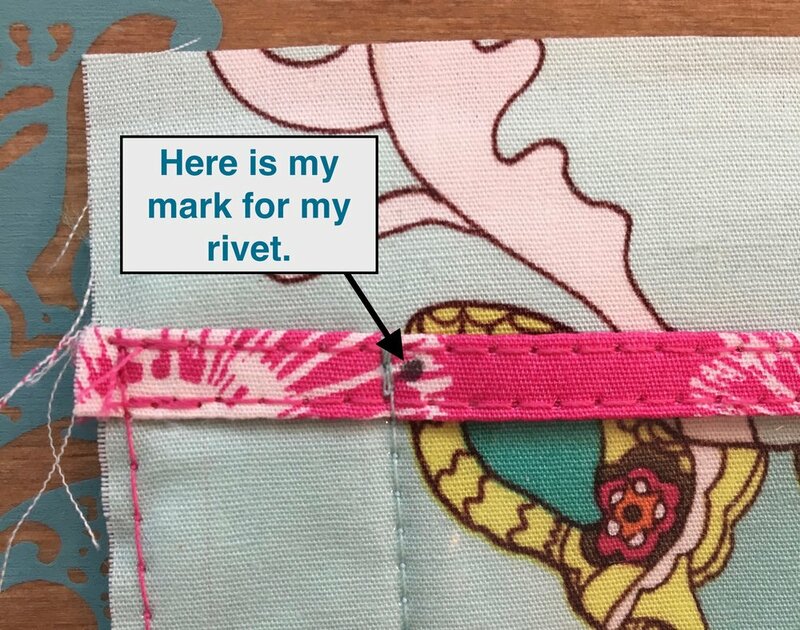 Last month I shared a tutorial for an alternate way of making the ID window pocket for a Kristine ID Wallet that Mary Wauters Divita had shared with us on the Uniquely Michelle Sewing Patterns Facebook Group. 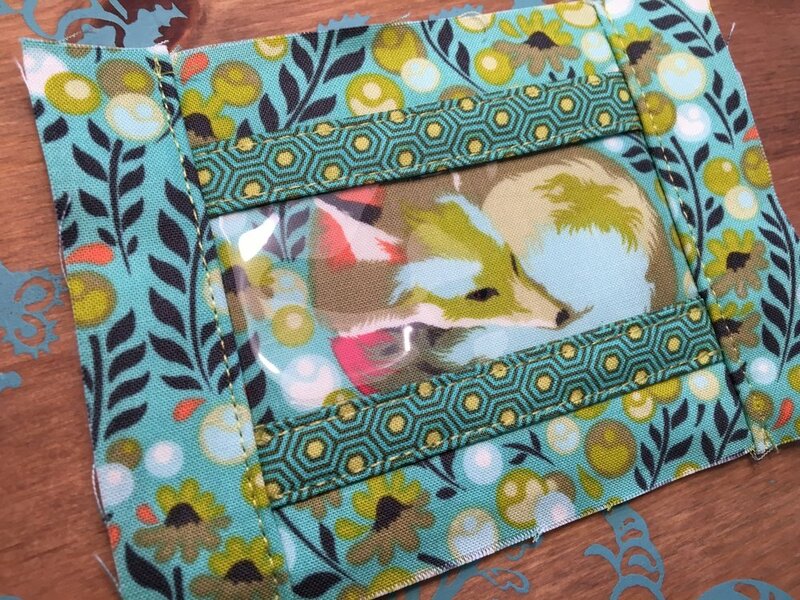 Today, I am sharing yet another alternate way to make the ID window pocket for a KIDW! This method is one that Pam Sutey came up with. 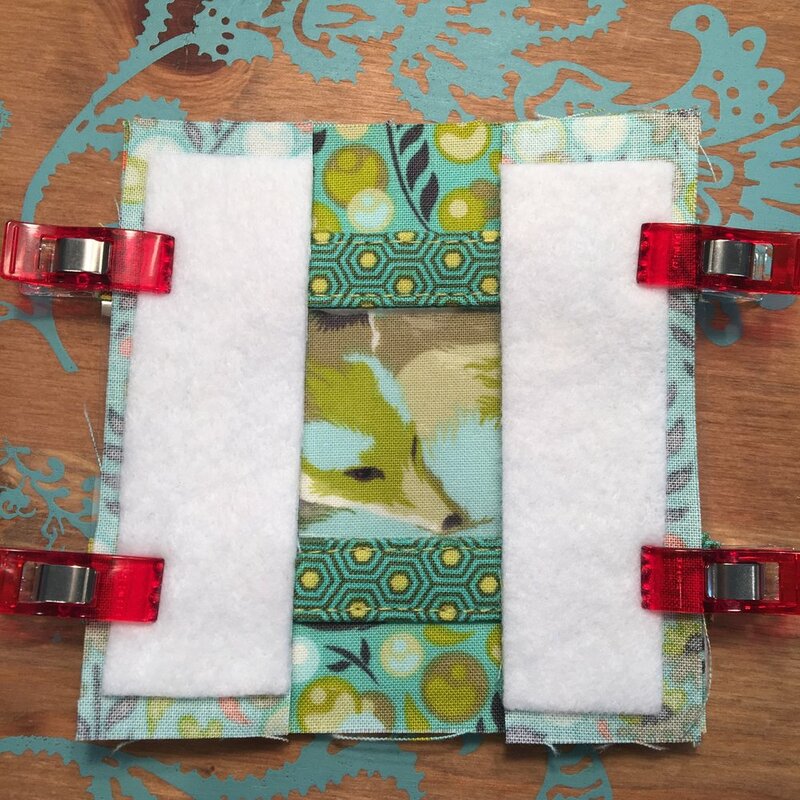 I like Pam's method for making the ID window pocket, it is simple and great for showing off a favorite fabric. Check out the great Kristine ID Wallets that Pam made using her method in the slideshow below! Don't you just love the way Pam's Kristine ID Wallets look? Pam shared her method with me so I could share it with you - thanks Pam! I made a Kristine ID Wallet using Pam's method because I wanted to be able to add process pictures to Pam's tutorial, but also because I wanted to try it out. Pam's method is fabulous, I really think you will like it . . . and of course the extra bling that the rivets add is perfect! 1. My work ID needed a bit more room to show the entire front of the badge. 2. I wanted to show off some fabric I had fussy cut and was certain I would use too many brain cells trying to match up the ID pocket frame. Cut vinyl pocket fabric trim 5 1/2" x 1". No interfacing needed on the trim. 2 rivets - I used very small ones, 5mm width and a short post. Fold and press the fabric trim piece in half the long way, then fold the raw long edges in toward the center crease to create 1/4" binding (see photo below). Slip the top edge of the vinyl into the open side of the 1/4" binding and top stitch close to both long edges to create the top trim (see photos below). Make a small mark at the top and bottom of the wallet back piece, 7/8" in from the left side and 7/8" in from the right side - these seams will reduce the width of the pocket (see photo below). Without the seams, the vinyl pocket might be too loose, allowing the ID to slip out. Clip the vinyl pocket to the wallet back piece, keeping in mind which direction you want your back piece to go if you are using a directional fabric. Line up the sides and bottom edges of the wallet back and the vinyl pocket (see photo below). Use an ID badge, credit card, or business card to test the pocket space to make sure it is the size you want it, keeping an eye on the 7/8" markings you made on either side. After the small rivets are installed, the wallet is constructed following the pattern as written. Thanks so much Pam for your great instructions! You can see more of Pam's beautiful work on Instagram @bluebyebye. 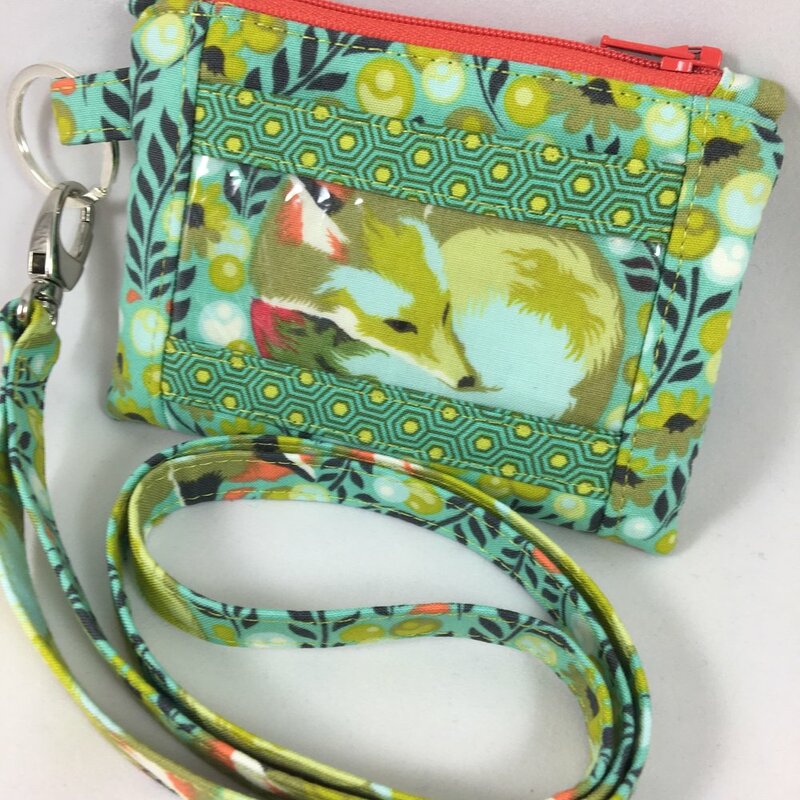 If you would like the pattern for the Kristine ID Wallet, you can purchase it from the Uniquely Michelle Website Shop, the Uniquely Michelle Etsy Shop or the Uniquely Michelle Craftsy Pattern Shop. Make sure to sign up below to receive the Uniquely Michelle newsletter so you can keep up with the latest happenings at Uniquely Michelle! Did you know that, of the three Uniquely Michelle shops, there is one that stands out as the best? It's true, not all Uniquely Michelle shops are created equal. Recently, I updated all my listings in all three of my shops - Etsy, Craftsy and the Uniquely Michelle website shop. One reason I updated the listings in the Uniquely Michelle shops is I wanted to add links within the listings that would be helpful for customers to find those hidden treasures - tutorials, sew alongs, etc. that can be buried in blog posts. Unfortunately, Etsy and Craftsy will not allow me to add external links. Basically, Etsy and Craftsy want you to stay on their websites once you are there and not get distracted by going elsewhere. I understand this, but I still wanted customers to have the ability to link to the hacks, tips, sew alongs, etc. that are out there for some Uniquely Michelle patterns. The only place that I can do this is the Uniquely Michelle website shop. For this reason, I feel that the best place to buy a Uniquely Michelle pattern is from the Uniquely Michelle website shop. I am so excited that a customer can go to a listing for a Uniquely Michelle pattern in the Uniquely Michelle website shop and find links to some great bonus information for that pattern like, Lindsay Wristlet Week or the tutorial for making an alternate ID window for the Kristine ID Wallet. By the way if you are wondering if my recommendation has something to do with profits, but it doesn't, Craftsy wins that prize. The links that are part of the listing for the Lindsay Wristlet on the Uniquely Michelle website shop. Even if you have already purchased one of the Uniquely Michelle patterns, the Uniquely Michelle website shop is a good resource. You can go to the listing for the pattern you are making and see links to the various blog posts that can help you as you make your item or give you some fantastic ideas of how to make it even better. As you might guess, the Kristine ID Wallet has several links to blog posts and tutorials. Some of the links that are part of the listing for the Kristine ID Wallet in the Uniquely Michelle website shop. So when you have a chance, check out the links included in the listings for the patterns in the Uniquely Michelle website shop. I will continue to add links that are relevant to each pattern so that it continues to be a great resource for information for Uniquely Michelle patterns. Make sure to sign up to receive the Uniquely Michelle newsletter below so you can stay in-the-know on all things Uniquely Michelle! I was excited to see that Kylie Simonton of Lean Mean Sewing Machine wrote an eBook about selling handcrafted goods at craft shows! Her book is called, Mastering the Craft of Craft Shows. Today, I am sharing my impressions of Kylie's eBook as well as giving you an idea of what you will find in her book that makes it worth purchasing. I do not know Kylie personally, but I do know enough about her through Facebook to know that she always seems to be selling her handcrafted bags at craft shows . . . and she is very successful at it! I knew that her eBook would be something that Uniquely Michelle customers who sell their handcrafted bags might find useful - this is the reason I bought her eBook, and the reason I am writing this review. I was very impressed with all the great information that Kylie includes in her Mastering the Craft of Craft Shows! Near the end of this post, I have included some questions that I asked Kylie and of, course her answers - don't miss this opportunity to get even more information from Kylie! Now, read on to find out more about Mastering the Craft of Craft Shows! There is also an opportunity for you to win Kylie's eBook in a GIVEAWAY - see details at the end of this post! Kylie started selling at crafts shows in 2014. She hasn't been successful selling at every show (she shares a story about this in her book), but she has methodically worked to determine what works and what doesn't. She shares her wealth of knowledge in her eBook, Mastering the Craft of Craft Shows. 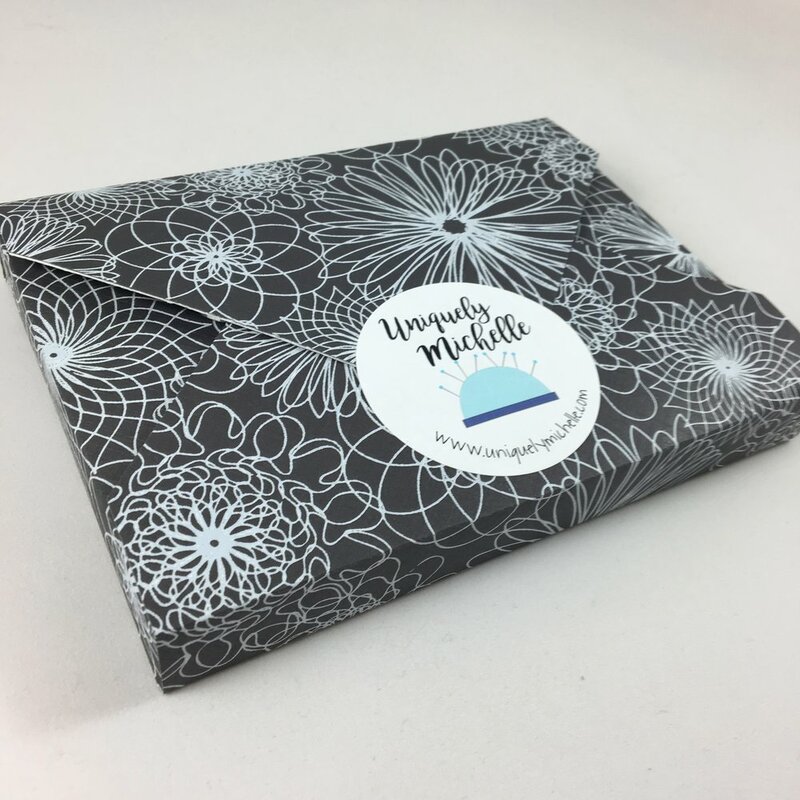 Kylie not only shares her tips on how to be successful selling at craft shows, but she does so in an easy-to-understand way that gives the reader confidence to implement her practices. Mastering the Craft of Craft Shows includes an introduction and 12 chapters. Each chapter addresses a different topic, from determining your inventory and seasonal trends, to the pricing and displaying of products. Kylie spends several chapters on customer-related issues; like what forms of payment to accept, how to promote and sell products, how to engage with customers (both the good and the not-so-good), and how to really listen to customers to improve future sales. You will even learn how to deal with competitors at crafts shows. The final chapter of Kylie's eBook is an extensive list of what to bring to a craft show, both what you will need for selling your handmade goods as well as what you will want for your personal comfort too. I really like Kylie's chapter on pricing where she talks about how it can be difficult to ask people to pay what an item is actually worth and how she has worked through this. Kylie also goes through an example of EXACTLY how she determines the accurate and fair price an item - this chapter is useful even if you don't sell at craft shows, but sell through another avenue. The chapter in Kylie's eBook on choosing the right craft show was very interesting. Her insight on how to choose crafts shows may not be what you would expect, but Kylie shares her experiences to explain her reasoning on which craft shows to choose to sell at and why some are not worth your time and effort. Each chapter ends with homework . . . yes homework. But no worries, the homework is very beneficial; it is designed to get you thinking about what will work for you and how you can have success selling at crafts shows. Kylie suggests in the introduction to her eBook that you take notes as you read her book, and I would recommend that too. I love Kylie's thought that, "The only dumb ideas are the ones not written down!" I highly recommend this eBook if you have thought about selling or already sell in craft shows. If you are thinking about getting into craft show vending, this book will help you get started and it will help you avoid some pitfalls. If you already have experience selling at a few craft shows, this book will give you great tips and ideas for taking your craft show selling to the next level. You can purchase Mastering the Craft of Craft Shows eBook in PDF format on her website, Lean Mean Sewing Machine. If you would prefer the eBook format rather than the PDF format, it is available on Amazon and iBooks, just search, "Mastering the Craft of Craft Shows" on either Amazon or iBooks. I asked Kylie a few questions that I had after reading her book. I think you can get even more insight from her answers, so I have included them here - enjoy! In your book, you talk about your “$20 profit craft show” - yikes! Other than that show, have you always been successful selling at craft shows? Has your success increased over time? Where does the majority of your profit come from, craft shows or online sales? A majority of my profit comes from craft shows. I find that people like to see, touch, feel, and open products in person. If they can get a better view of the product and imagine themselves using it, they are more likely to purchase whatever item I’m selling. It also helps that they see the maker behind the products. It makes things more personal and people LOVE when you remember them the next time around. Does selling at crafts shows increase your online customer base and therefore your online sales? I have definitely had an increase in online sales because of my presence at craft shows. I often receive emails with a “hey, I saw you at [location] and I loved/bought some of your products.” This especially comes into play around big holidays such as Christmas. Lots of people are flocking towards handmade for unique gifts not sold in stores. Do you offer a custom order option at craft shows? If so, how important is that to your overall profit? I do offer custom orders to potential customers who visit my booth at craft shows. They may not turn around right away and order from me, but I give them a business card and tell them to email when they are ready. These same people usually get in touch with me around the holidays, birthdays, graduation, etc. when shopping for gifts for loved ones. I would say that it is important to overall profit not just from that one person, but to all the people that they tell. People are so blown away when I make something custom for them. Word of mouth is probably the best advertising a business owner could possess. If you “wow” one person, you’re sure to wow at least one more. Thank you Kylie for sharing such a wealth of valuable information in your Mastering the Craft of Craft Shows eBook and for answering my questions! 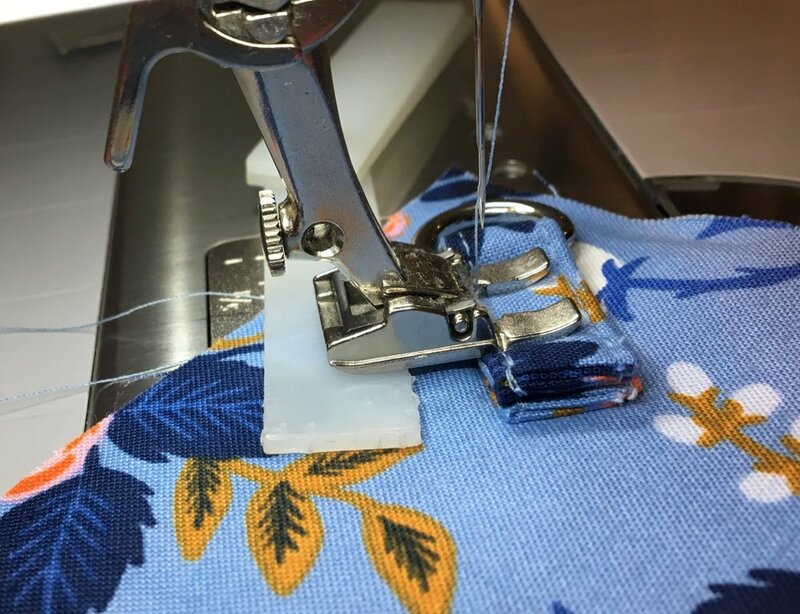 Check out Kylie's Lean Mean Sewing Machine website, follow her on Instagram, on her Lean Mean Sewing Machine Facebook Page, and join her Lean Mean Sewing Machine Facebook Group. How about a giveaway? This is such a great book that I am giving one PDF version away! And . . . Kylie wants to give a copy away too, so now you have two chances to win a copy of her book! To enter the GIVEAWAY, just comment on this post! You only need to comment once to be entered in the drawing. I will randomly draw two winners to receive a copy of Kylie's, Mastering the Craft of Craft Shows on Thursday, July 12th at 10:00am MST. Calling all coffee drinkers - we don't want to leave you out in the cold with the Tea Time Tea Wallet! 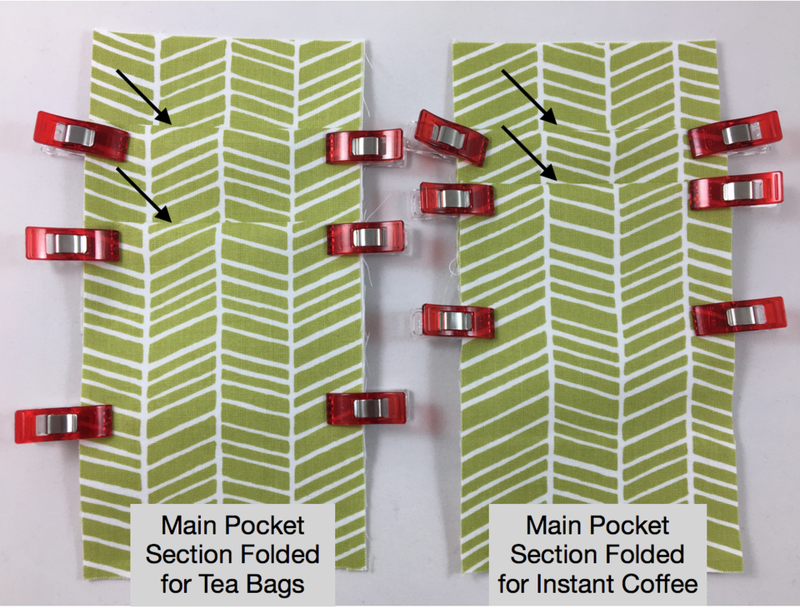 Today I am sharing a tutorial that will show you how to change up one of the pockets so that you can put instant coffee packets in the Tea Time Tea Wallet. Jenniffer Howling, one of my testers came up with this ingenious idea while testing the Tea Time Tea Wallet (see Jenniffer's coffee version of the Tea Time Tea Wallet below). 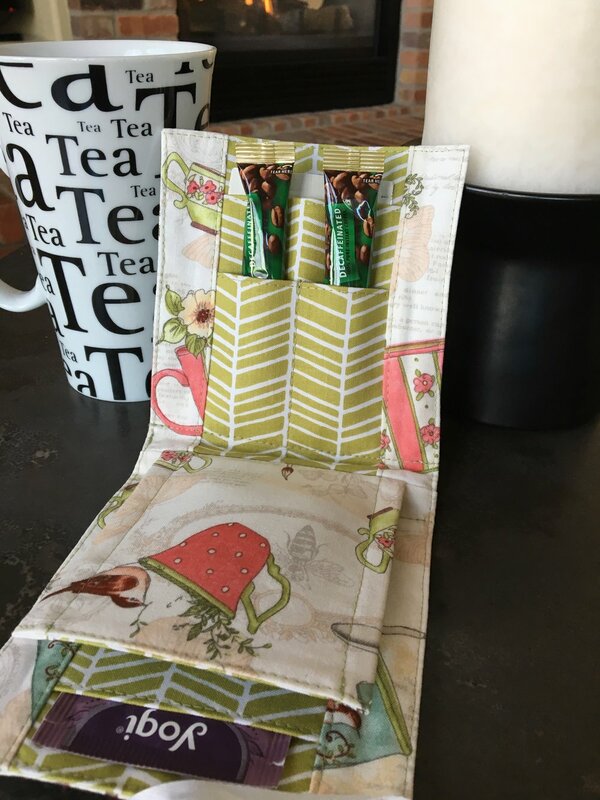 You could use this altered pocket to hold sweetener or other drink mixes as well. 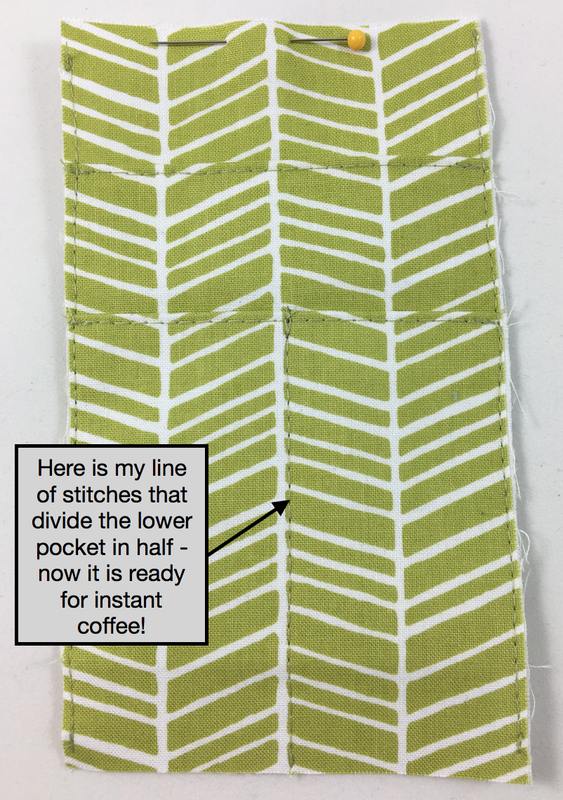 This tutorial explains how to alter one of the lower main pockets but you could alter both lower main pockets if you want to add even more places for coffee, sweetener or drink mixes. 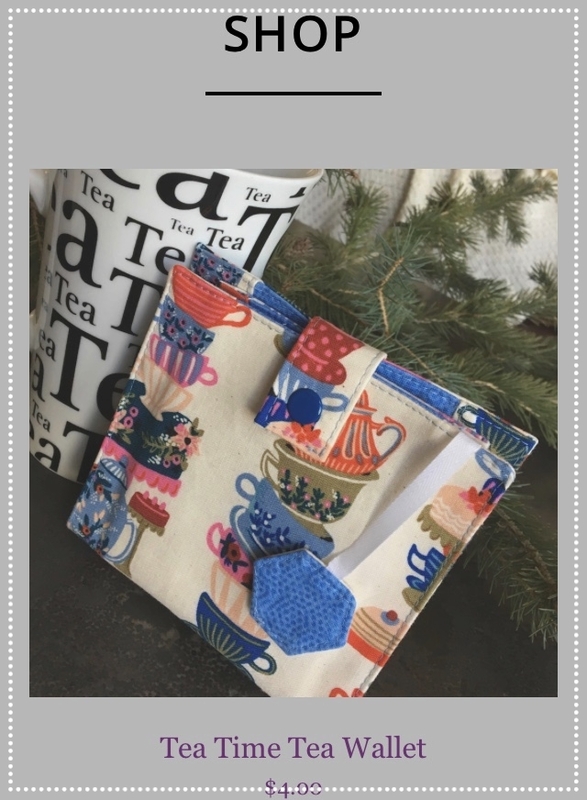 If you don't have the Tea Time Tea Wallet pattern yet (you will need it to create this coffee version of the wallet), you can purchase it from the Uniquely Michelle Website Shop, the Uniquely Michelle Etsy Shop or the Uniquely Michelle Craftsy Pattern Shop. Jenniffer's Tea Time Tea Wallet . . .
with pockets for instant coffee! We will be changing up the folds on one (or both if you choose) of the main pocket(s) and we will also be altering the way the bottom of the Tea Time Tea Wallet is made. For this option, you will not add a piece of Peltex to the bottom. Start by following the directions given in step 1 of the Tea Time Tea Wallet pattern. To make the coffee option, things start changing when you reach step 2 of the pattern. If you want to alter one main pocket, you will want to cut your main pocket piece in half before folding the main pocket. When you cut the Main Pocket piece in half, each Main Pocket piece should be 3 1/2" wide. (See photo below) Fold one Main Pocket piece using the measurements in the pattern in step 2 (Fold Main Tea Bag Pockets) and fold the second Main Pocket piece using the measurements below. If you want to alter both main pockets, fold the pocket using the measurements below without cutting it in half first. ◌ Mark line #1 @ 4” away from the left short edge of the fabric piece. ◌ Mark line #2 to the right and 2 3⁄4” away from line #1. ◌ Mark line #3 to the right and 4” away from line #2. ◌ Mark line #4 to the right and 2 3⁄4” away from line #3. You can see the difference in the pocket folds for the Main Pockets in the photo below - the left Main Pocket section is folded for tea bags and the right Main Pocket Section is folded for instant coffee packets. The arrows in the pictures are pointing to the tops of the pocket folds. Hint: You may want to in some way mark the coffee pocket so you can easily keep track of which one it is. I put a pin at the top of my coffee pocket. There won't be anymore changes until step 12, so we will see you back here once your coffee version of the Tea Time Tea Wallet is almost finished! Once you have your lines marked, you can continue with the second bullet point ("Top-stitch through all layers across . . .") under step 12. (See photo above) You won't be adding the Peltex piece, so you can ignore the directions that have to do with the Peltex. You are almost finished making your coffee version of the Tea Time Tea Bag Wallet, just one more step! 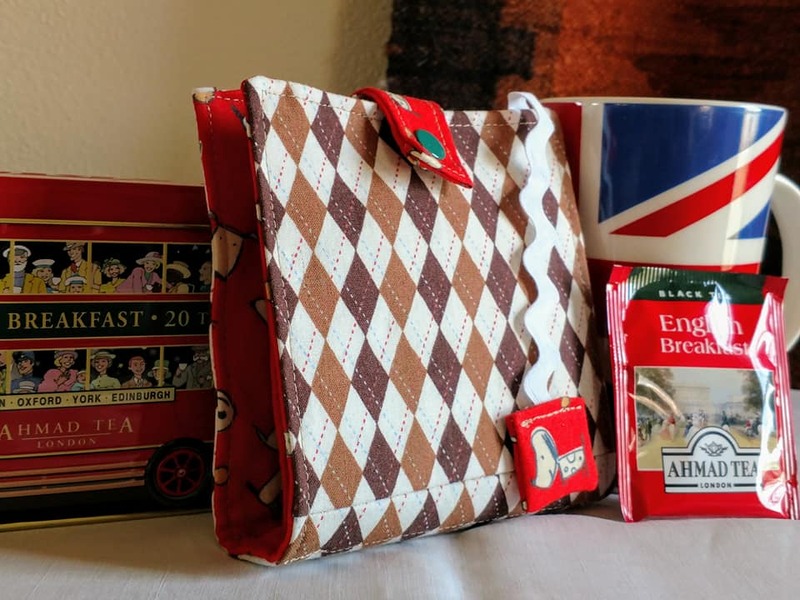 Please share pictures of your amazing Tea Time Tea Wallet creations (coffee versions too) on Instagram (#uniquelymichelle #teatimeteawallet) and in the Uniquely Michelle Sewing Patterns Facebook Group (a fun place to share you Uniquely Michelle creations and see other's creations too). You can follow Uniquely Michelle on Instagram, on the Uniquely Michelle Facebook Page and on Twitter. Remember to sign up for the newsletter below!